Bali Rafting + Bali Bird Park + Tanah Lot tour is an interesting Bali Rafting tour package where you will enjoy Bali white water rafting at Ayung River Ubud then combine with Bali Bird Park with 1000 of birds and tropical garden, then enjoy a tour of Tanah Lot Sea Temple with thousand of visitors while enjoying a spectacular sunset. 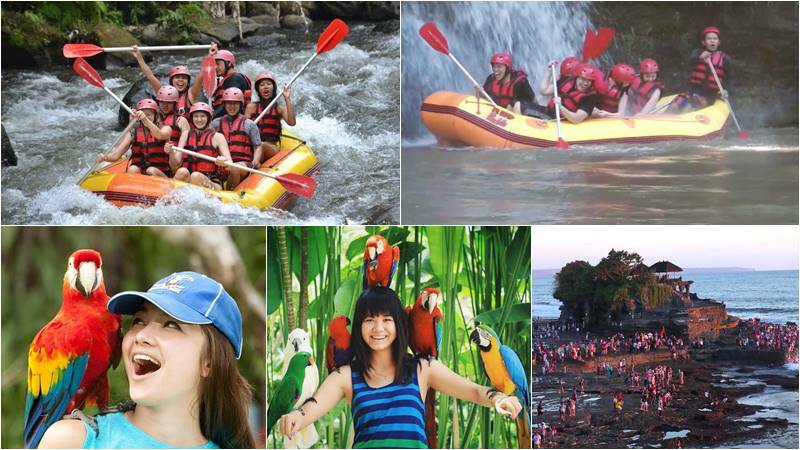 So book now only with Bali Rafting Adventure. 17.30 – Visit Tanah Lot Temple. Come and join the Ayung River professional team to enjoy fantastic and unforgettable whitewater rafting adventure in Bali through a winding gorge, the magnificent jungle and the beautiful terraced rice field. The water volume is stable all year round with few water speed, which allows you to enjoy yourself with lots of fun. From the start, you will be fitted with life jackets and helmets. Our trained professional guide with international standard equipment will help you manage your safety through approximately 12 km in an exciting grade II and III rafting site for about 2 hours. Follow his instructions and paddle along the way, laughing, shouting and having an unbelievable adventure. Ayung rafting tour is the best way to experience the beautiful of the Ayung River. At the finishing points, shower, towel and change will be provided, followed by Indonesian Buffet lunch services. Bali Bird Park is a special and unique educational attraction suitable for the entire family. Take part in the world’s largest and finest bird collection, plus fantastic South American and African birds. With two hectares of botanical landscape, the park offers a sanctuary for nearly 1000 birds of 250 different species. The park is home to a wonderful display of flora with over 2000 tropical plants including fifty varieties of palms alone and many butterflies, and tropical birds can be found, such as Bali Starling, Cassowary, Peacocks, Cockatoos, Asia’s Bred Bird and many more at the Bali Bird Park, Gianyar. In the middle of the sea stands this Balinese Hindu temple in the solid rocky land. In the particular time of sunset, this temple is very beautiful. We can see this temple with a spectacular view of the sea and the sunset, from several spots. When the water goes tide we find a drift in the temple, because the sea waters surround this temple. During the low tide, the snake, who believe as the guardian of the Temple, can be seen by the visitor too. Ticket for the rafting at Ayung river.